Maruti Suzuki, the country’s biggest carmaker, was looking to appoint a fifth dealership in Lucknow, the capital of Uttar Pradesh. It spent a few months last year trying to find a ‘suitable’ investor, but could not find one. With the rising cost of land and capital, no investor with an automobile background came forward to invest. The search is still on. “There is no such challenge of finding the partners for Maruti Suzuki. This (Lucknow) may be a one-off,” said a company spokesperson, in response to queries. This may be a one-off for the company, whose dealer partners are better off (compared to most other companies) and enjoy the edge of being associated with the most sold brand in the country. 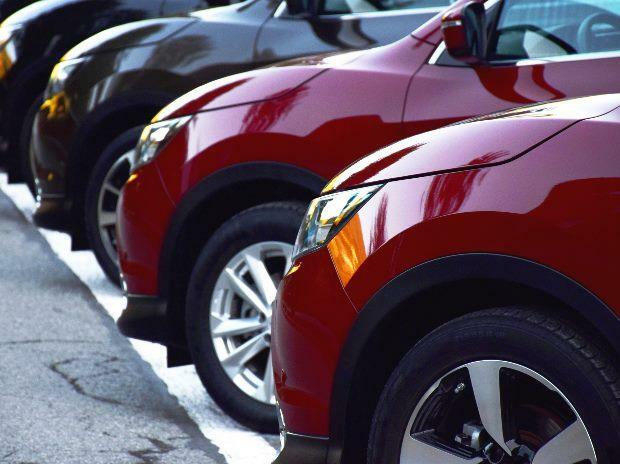 But challenges are beginning to emerge in finding dealer partners because investors have multiple avenues to park their money outside the automobile business. “A new dealer in Lucknow may have had to invest Rs 150 million in setting up a Maruti Suzuki sales, service, and spares network. This excludes the cost of land. Adequate returns could have been tough,” said a person familiar with the development. 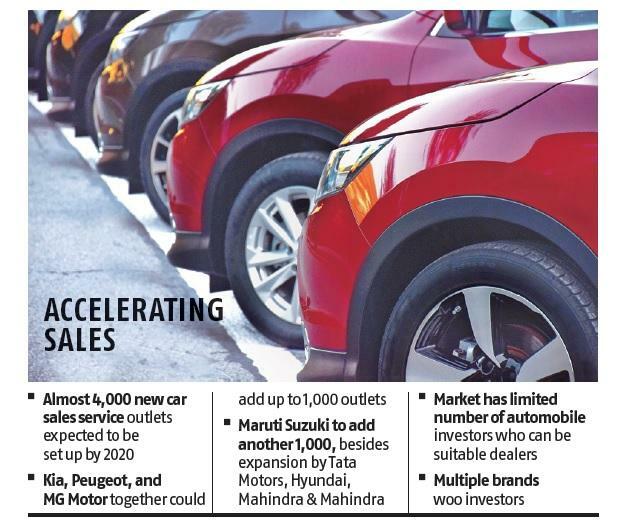 At least 4,000 car sales service outlets could be set up over the next three years with the entry of three carmakers — Kia, Peugeot, and MG Motor — and the network expansion plans of the existing players, and by the end of the three-year period, India may become the third-biggest market. Besides Maruti and Tata Motors, players such as Hyundai, Mahindra & Mahindra, Ford, Renault, Honda, and Škoda will add dealerships. There will be addition in the luxury car segment too. The 4,000 new outlets do not even include the expansions that will take place in two-wheelers and commercial vehicles. A limited number of dealer investors will be wooed by multiple brands. Tata Motors, which has an aggressive network expansion plan, is also concerned about the challenges. “Apart from the suitable partner who has adequate finance, network coverage, business experience, and management bandwidth, the real challenge in this scenario is real estate for showroom and workshop, especially in metros,” said a company spokesperson. The company has 675 sales touch points and plans to add 200 every year for the next few years. Realising the need to reduce the burden on future investments in dealerships, especially in cities, Maruti Suzuki has ventured into creating a pool of land parcels. The company is learnt to be investing Rs 8 billion in land parcels in the current financial year (FY18). Maruti has a network of 2,500 sales outlets (including Nexa) and is planning to add another 1,000 by 2020. Brands like Maruti have a policy of not letting their dealers invest in rival brands and this also limits the number of eligible investors. Recently, Hyundai (which has a liberal dealership policy) stopped its 60 dealers from applying for dealerships of Kia, its sister brand. Kia, Peugeot, and MG are likely to start retailing cars in 2019. Industry experts say there will be a shortage of right and experienced dealer partners who understand the business and are committed to it. The disappointment of dealers of brands like General Motors and Fiat Chrysler Automobiles has turned investors cautious. Amit Kaushik, managing director for India at Urban Science (a company advising carmakers in network development), says it is not always lucrative to invest in the auto dealership business as the market is crowded and there is competition from the same brand as well as rivals in the same city. “We have been regularly observing that most players open touch points without adequately evaluating the region’s potential and the viability of the investor. This has created a loss-making business in many cases,” he said. Puneet Anand, general manager and group head (marketing) at Hyundai, says financial health, understanding the automobile business and customers, and local market conditions are key to running automobile dealerships in India. The company has 490 dealerships and will add another 100 in three years.